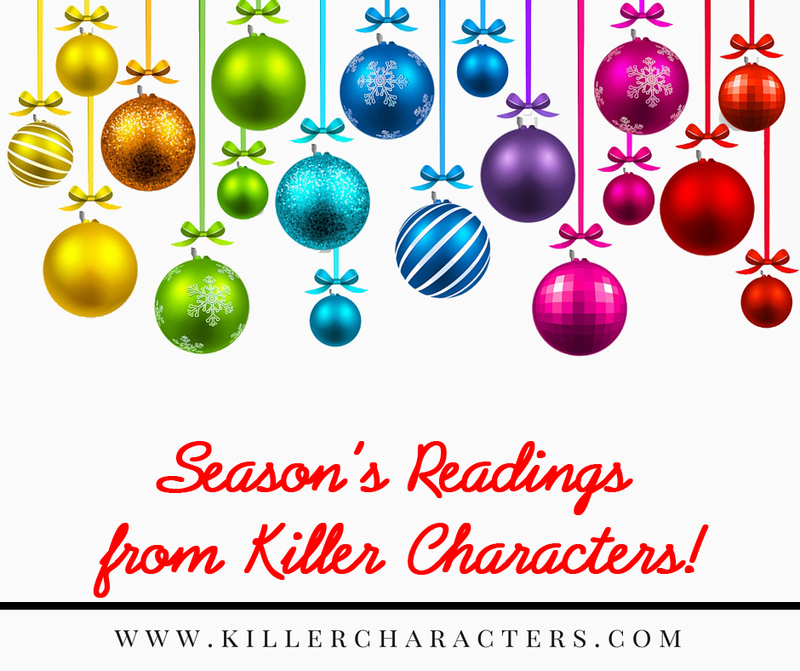 Killer Characters: It’s Christmas in Christmas Town! Perfect time for a #Contest! It’s Christmas in Christmas Town! Perfect time for a #Contest! The town of Rudolph, New York is a Year-Round- Christmas destination. You might think that because we celebrate Christmas all year, we are bored and jaded when the time actually arrives. Anything but. As part of our Seasons Readings festivities, and to help you get in the mood, I’m offering a signed copy of Rest Ye Murdered Gentlemen, along with a charming tree ornament with a puppy peeking out, and a package of holiday themed tissues featuring none other than Matterhorn, Merry’s Saint Bernard. Please leave a comment with your email address to enter the contest. And then Like Vicki Delany & Eva Gates' Facebook Page for news about new books and more contests coming soon. Contest closes evening of December 2. Great pictures of Rudolph - I think I want to live there. I love the holidays. Thanks for the giveaway. The pictures are beautiful. (I wish Rudolph was a real place!) I enjoy reading holiday themed cozy mysteries. Thank you for the chance to win. I am midway through Rest Ye Murdered Gentlemen! Enjoyable read!!! I was in Quebec City a couple of weeks ago. The old city is fabulous. Did you know QC is the only (still) walled city in North America? Wonderful pictures. Helps me get into the mood. Beautiful pictures and this book is on my wish list. Thanks for the chance. They had such marvellous decorations in Quebec City. Sounds like a very great town. The pictures are great. I don't think there's anything more lovely than Christmas at night. I love all the outdoor lights - so peaceful and quiet! Love the pictures! I have some beautiful pictures of Quebec City as well from my honeymoon. It must have been a marvellous place for your honeymoon. I love all the pictures. It would be wonderful to live in a town that celebrates Christmas all year long. Thanks for the chance to win. Yes! It's time for Christmas books. Thanks, Elizabeth. I also write the Lighthouse Library mysteries under the name of Eva Gates. Rudolph sounds like it would be a wonderful place to live. I love the photos of Quebec City! Thank you for the giveaway, and for all the pictures to get me in the Christmas spirit! bunkielisa at gmail dot com. Nothing says Christmas better than some murder and mayhem. Would love to win. Thank you for the chance to win. I'm not sure I'd like to live in Rudolph---but I think I'd really like to visit there during the holiday season. Thanks for the contest. It might get a bit much, I agree Sue. But it was sure fun to write about. Such a BEAUTIFUL area! You're being so generous to your readers~ Thank you!! It is always my pleasure, Robin. Thanks for the contest! I already bought Rest Ye Murdered Gentlemen for myself. I haven't read it yet though. I am waiting for December! I bet it would make a great stocking stuffer! Also I love the tissues and the ornament. Thanks for the chance to win and merry Christmas!!! Merry Christmas to you too, Abby. I'd love to win this great prize! Happy Cyber Monday. I guess that's now a thing. They are different. These are much lighter than the Molly Smith books. Speaking of Molly, Unreasonable Doubt will be out in February, the 8th book in the series. I would love to win a copy! Thanks for the giveaway!! Love the title! :) Love the pictures as well... makes me want to go there... Christmas or not. The pictures are beautiful! Thank you for sharing and for the chance! What a delightful town. Would love to read the book. Love the Lighthouse Library series, I'm sure I would enjoy this book as well. I can't wait to read this series. Thanks for the chance to win. We have not been to Quebec City in years and years and your lovely pictures gave me the urge to go again. Thank you for the great photos and for the Christmas greetings. Wishing you the same. Great pics!!! Thanks for sharing. Love the book's cover. Love the pictures. Need to add this series to my reading list for sure! Would love to read this - thanks. It's raining here too, and I am in the mood for snow! Lovely pictures, the lights especially get me in the mood for anything Christmas related. Thanks for the chance to win. Great pictures and a great book! Very pretty. I love all the stones in the walkways and buildings. The red shutters are awesome, too. Beautiful pictures, thanks for the chance to win your book! Quebec City really is a marvellous place. Thanks for joining in, everyone. I'm glad you all enjoyed the pictures. We'll be choosing a winner tomorrow. Cool pics, liked the page. kamundsen44ATyahooDOTcom. I would love to visit Rudolph, New York. There is a Santa Claus, Indiana but it is all geared towards very young children. I firmly believe that Christmas is for everyone. Would love to read your book. Love the pictures.. Thank you for the chance to win. I think it would be neat to celebrate Christmas all year round. Music could be played all year round along with other things. Pictures are great too. Thanks for this opportunity. Thanks. Looking forword to reading this new one. esp at this time of year. Thanks for entering the contest everyone. The lucky winner has been notified. 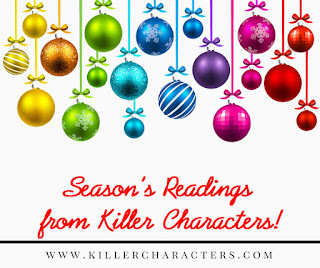 Don't forget to pop into Killer Characters every day for more great stories and contests.